We know how important it is to be on top form. This is why we have extensively researched to produce one of the best skateboard bearings on the market. These all-round bearings perform in all conditions, suitable for all skaters and riding styles. When developing skateboard bearings, there are many qualities to consider. The higher the ABEC rating, the lower the tolerances are when the Bearing is manufactured. Meaning that an ABEC 1 Bearing, although extremely cost-effective, will not perform as well as a higher ABEC rated Bearing. When most skating is done at around 4,000RPM, ABEC 5 is MORE than what you need! Ramping it up from an ABEC 1 and giving an extensive tolerance, the ABEC 5 will all the boxes in terms of cost, durability, weight and speed. Unlike an ABEC 1 or 3, the ABEC 5 bearing will glide and continue to do so with minimal effort giving ultimate stability (crucial when skating). For a tough deliverer, this bearing is for you! We’ve worked hard to develop and produce some of the best skateboarding bearings on the market. 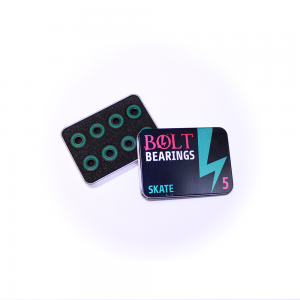 Our own brand of skate bearings – the BOLT ABEC 5 bearings – are ideal skates and skateboards in all capacities, with extensive tolerance in terms of cost, durability, weight and speed. They are aesthetically pleasing too, available in multiple colours. When you’re skating whether professionally or just as a hobby with your friends, you want to be at your best no matter what. ABEC 5 bearing classes are cost effective and get you to a fast speed for a fraction of the cost. Removing bearings is really easy. You’ll need a combination wrench to start with – but this is the only bit of equipment you’ll need! No expensive purchases to be made or technical expertise to learn. Turn the skateboard on its side and begin to unscrew the bolt and washer attached to the wheel. Remember to use a wrench that is the same size as the nut otherwise you’ll wear the head out and make it really difficult to replace. If you’re replacing your wheels, you may want to replace your bearings too. These are really, really easy to fit. When you buy your new skateboarding bearing set from Autosport Bearings, you’ll receive a colour-coded tin to match the bearing of your choice, which comes as a set of 8, on the basis of two bearings per wheel. Head online to speak to one of our experienced team or to order straight away about getting your hands on one of these awesome sets with its own colour coded tin, or to mix and match the colour sets. Supplied in sets of 8 (for each board has 4 wheels, with 2 bearings per wheel). ABEC 5 – Bearings are standard for most types of skateboarding. This rating gets you a fast speed at an affordable cost!